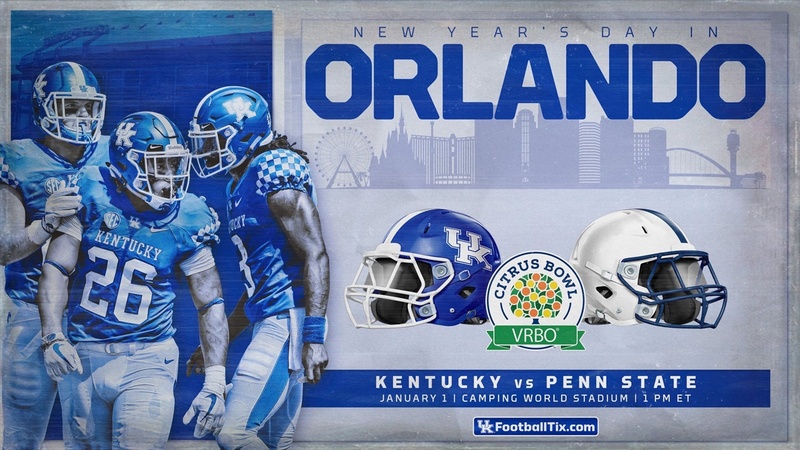 The #14 Kentucky Wildcats will seek their 10th win of the season against the #12 Penn State Nittany Lions in the Citrus Bowl on New Year’s Day from Orlando, Florida. After a 9-3 regular season, the Cats will be rewarded with a trip to their biggest bowl game in 20 years; The 1999 Outback Bowl, also against Penn State. This will be the sixth match-up between the two schools, and the first since the Outback Bowl. Penn State currently holds a 3-2 series lead. The Nittany Lions will also winter the game looking for their 10th win of the season. The game will be televised on ABC at 1:00 eastern on New Years Day 2019.